Years ago, I suggested that there was no current or impending oil shortage. Growing consumption, static U.S. production, and other reasons offered then and now did not imply that prices would rise. That conclusion only made sense if the pressure on reserves was increasing, a situation that would be signaled by rising costs of maintaining and expanding output. There was and is no sign of this. Falling Oil Prices: Where Is the Floor? The recent precipitous decline in world oil prices from $28 per barrel in November 1985 to $12 per barrel in March 1986 has perplexed most industry analysts and OPEC watchers. As oil prices continue to deteriorate, the central question now seems to be: "Is there a price floor below which oil prices will not fall; and if so, where is it?" 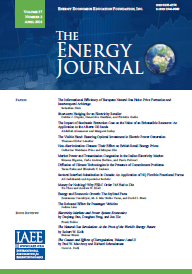 Economic theory would suggest that at some price level, short-run marginal extraction costs of oil will eventually exceed marginal revenues from that production, leading to the widespread abandonment of the relatively higher-cost oil wells currently operated by competitive producers in non-OPEC areas. Presumably, once the price of oil falls to this floor, massive production cutbacks in high-cost, non-OPEC areas due to abandonment and reductions in new drilling activity would enable the lower-cost OPEC producers to significantly expand their market shares, thereby eliminating any incentives for further price reductions. In recent years, the literature in the field of general equilibrium modeling has increased. For long-term energy projections, general equilibrium models are more adequate than standard econometrics in evaluating alternative economic policies in a theoretically consistent framework. The well-known structure and economic mechanism of those models makes it easier to analyze structural changes of prices and quantities demanded or supplied for a given data set of an economy, national income accounts figures, and trade balance effects. The dynamic formulation of these models via investment decisions and capital formation also enables an intertemporal interpretation of structural adjustment and growth processes. Our purpose is to estimate cost shares and own-land cross-price elasticities of the demand for factors in the production of manufacturing output. To achieve more precise estimates than those of previous researchers, we do not consider energy a single unified input. It is disaggregated instead into electric and nonelectric energy. The period considered spans the years 1954 to 1977. The following brief review of the literature outlines the background.Hudson and Jorgenson (1974) studied the demand for manufacturing production factors. They subsequently estimated the own- and cross-price elasticities of demand for the various factors by applying a translog cost function at the industry level. Their model included capital, labor, energy, and nonenergy inputs. The outlook for increased gas cooling use has not only improved because the residential air conditioning market in general has grown but also because many of the factors that depressed gas air conditioner sales earlier have been eliminated. First, the gas cooling equipment available today is more reliable and durable than before. During the 1960s, deficiencies in the gas absorption air conditioner caused an annual failure rate of about 8 percent. It is now less than 1 percent due to a number of improvements implemented by Arkla Industries during the 1970s. For example, the stainless steel generators in the units were improved with chrome plating, which prolongs the system life of the units. The quality of the steel in the restrictors, burner tubes, and evaporator coils was also improved. Residential gas air conditioners now carry a ten-year warranty on all defects in material and workmanship on the sealed refrigeration unit, while a compressor in an electric air conditioner normally has only a one- to five-year warranty. Most studies of reliable electricity supplies have been artful efforts to quantify the benefits of additional electric generating capacity (Webb; Andersson and Taylor). Outages are treated as the result of insufficient capacity, and outage costs are weighed against whatever outlays are necessary to bring new generation into the electrical system. Given the emphasis on long-run supply in the ultimate usefulness of these studies, research has focused to a remarkable degree on the cost of individual outage events (Sanghvi, 1982). The customer's long-run response to a change in reliability levels has rarely received much attention, and when it has been considered it has been treated as an analytically difficult or intractable problem. Our purpose is to show that the economics of long-run adjustments to a different level of reliability are in fact quite simple and easily incorporated into standard cost/benefit studies. For uranium to be used as fuel in light water reactors, the concen-tration of the fissionable U-235 isotope must be increased from the 0.711 percent found in natural uranium to about 3 percent. This service, termed enrichment, has been provided by the U.S. government since commercial nuclear powerplants began to operate in the late 1950s. The U.S. enrichment enterprise enjoyed a virtual monopoly until European competitors emerged in the late 1970s. These competitors not only took over service of their own national markets, but also began to offer enrichment worldwide under terms more attractive than those available from the United States. As a result, the U.S. share of the world market has declined to 47 percent and is likely to decline further in the absence of a competitive response.